NEW!!! Grindmaster 7446E Twin Midline 6 Gallon Fresh Water Coffee Urn - 120/208V. 12 gallons total capacity. 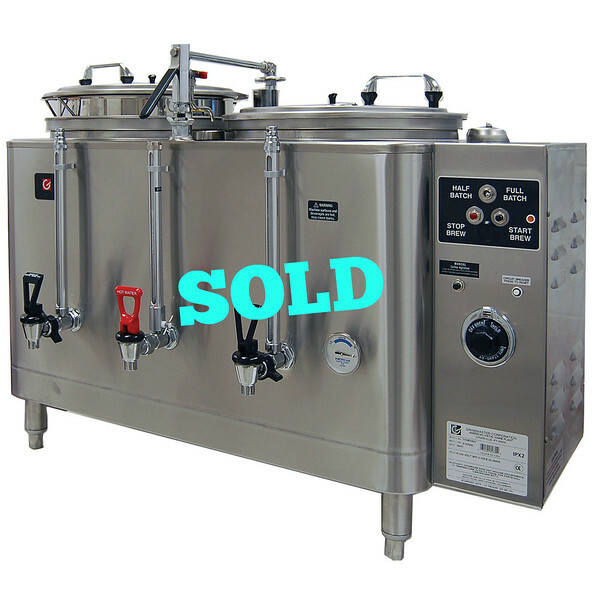 Easily brew large batches of fresh, hot coffee with the Grindmaster 7446E twin midline 6 gallon fresh water coffee urn! This urn uses a heat exchange brewing system to take fresh water and turn it into delicious, fresh coffee - perfect for keeping up with demands at your busy restaurant, diner, cafe, and more! * Twin, 6 gallon liner * Produces up to 32 gallons of coffee per hour * Teflon coated spray arm piston reduces liming for continued smooth operation * Brew temperature constantly remains within 5 degrees Fahrenheit of set temperature * Fully automatic push-button operation * Low water cutoff system protects heating elements from burn out * Four thermostat modes (Brew, Hold, Night Standby, Off) * Durable stainless steel construction * Fresh water for brewing is heated in a coil, nickel-plated copper heat exchange tube to reach optimum temperatures * Water compartment automatically refills as needed . Overall Dimensions: 34 x 16 3/4 x 33 1/8. The Grindmaster 7446E is UL and NSF Listed, and requires a 3/8" FPT water inlet and 120/208V electrical connection for operation. This unit must be hard wired; it does not come with a cord and plug. Why pay $5,500 retail or even $2,900 wholesale?